By popular Demand, the Point Guard U training classes have returned. 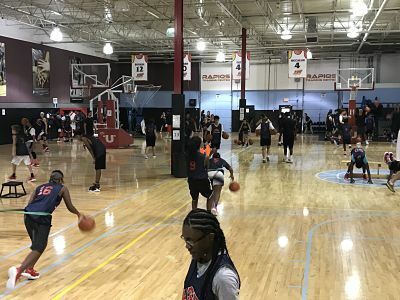 The PGU curriculum is designed to help aspiring and current point guards elevate their game utilizing innovative and advanced techniques! With an emphasis on the critical details (the leadership, improved footwork, the eyes, the change of pace and more) you will be able to apply it on the court. Being the Floor General is essential in today's Point Guard game. This is the program to join to take your game to the next level! This is a weekly training class that builds on previous sessions. It is important to attend as many of the sessions as you are able. Each player will review positioning, techniques for separation and attack angles. A combination of skills trainer and strength/power will be utilized. Trent played collegiately at both the University of Dayton (Freshman) and the University of Illinois (Sophomore, Junior and Senior Years). Trent’s career for the Illini (Big Ten) began as a walk-on, became a starter and Team Captain. He ranks as Illinois 5th all time leading 3 point shooter (avg 41%). Meacham went on to an outstanding 9 year professional career. He played in Austria, Germany, Italy and France as well as the top European competitions in the Euroleague, EuroCup and Champions League. Meacham was a Team Captain, named to various professional All-Star Teams and won multiple Championships during his professional career. Trent and his wife Theresa (a former Illinois Miss Basketball who played collegiately at St. Louis University) and two children are relocating from Champaign, Illinois to Wake Forest, NC.